Situated on the north side of this popular tree lined residential road, close to the junction with The Mall and virtually adjoining the vast expanse of Ealing Common. Within 10 minutes walking distance of both multiple shopping facilities at Ealing Broadway centre and Ealing Broadway station which offers quick and easy access into Central London i.e. Paddington 10 minutes, the West End 30 minutes and the City 40 minutes. Frequent service to Heathrow via Heathrow connect (20 minutes). Ealing Broadway Station is due to be redeveloped to accommodate the proposed new Crossrail service, linking Kent/Essex, through The City and Central London to Paddington, Ealing Broadway, Heathrow and Maidenhead. Parkside was constructed in 1966. Consisting of a pleasing development with brick and part rendered elevations, Parkside is constructed over four floors with a central archway allowing access to gardens and garaging at the rear. The building consists of 23 apartments divided into three sections, each with its own entrance and entry-phone security. Well established gardens, laid mainly to lawns, lie to the front and the rear of the property. Each apartment owns a lock-up garage. 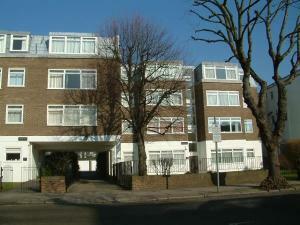 All flats are held on a lease granted for a term of 120 years from 25th March 1967. The residents' management company, "Parkside Hamilton Road (Ealing) Management Company Limited" is responsible for the management of the estate and now owns the freehold interest as well. All lessees own a share in the management company.